Kosha chicken is a spicy chicken dish from the Bengal region. Usually a whole chicken is used and in western countries a Cornish hen is suitable for this preparation. 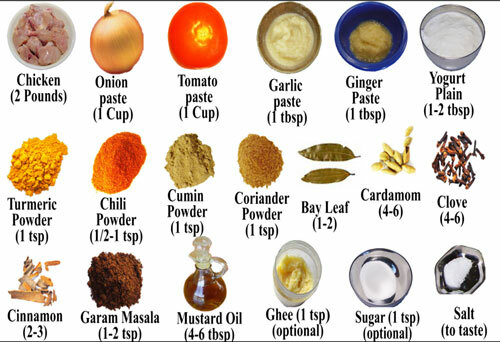 To the cleaned and washed chicken meat, add onion paste, garlic paste, ginger paste, yogurt, turmeric powder, red chili powder, cumin powder, coriander powder, salt, mustard oil. Marinate the chicken well with all the ingredients. Set aside for 10-20 minutes minimum. Several hours would be better, but overnight marinating is best. In an oiled pan, add the bay leaf, cardamom, cloves, and cinnamon sticks. Stir. When the spices are cooked (they will begin to “crackle”), add the marinated chicken. Stir. Let the meat cook, stirring occasionally to make sure it does not burn. After about 10 minutes, add the tomato paste, and mix. Cook for nearly half an hour until the oil separates out and most of the water has evaporated. Add the garam masala and the sugar (sugar is optional). Stir. Add ghee and mix. Serve kosha chicken with chapatti, luchi or hot steamed rice.